I recently received a copy of In A Time of War, Bill Murphy Jr.'s book on the West Point Class of 2002. I started reading a random chapter in the middle of the book, and quickly stopped and restarted at the beginning. I couldn't put it down. Bill Murphy Jr. offers an amazing look inside the warrior culture that drives men broken by war to return to the battlefield. He writes eloquently of commanders good and bad, of fobbits and frontline grunts, of homesick soldiers and of the too-often forgotten "home front" of worried, scared and proud wives and families. 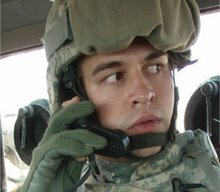 In A Time Of War took me back to Iraq- I smelled it, heard it, and tasted the dust. This is more than a book about West Point cadets- this is a book about the entire thin line -volunteers all- that protects and defends our great nation. It belongs on the shelf of anyone who cares to understand the military and its culture. If you want to know what pre-surge Iraq looked like, if you want to understand why soldiers volunteer for multiple tours, and conversely, if you want to understand why those same soldiers serve their time and leave, you should read this book.